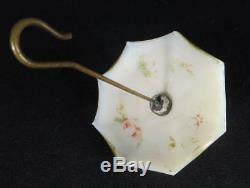 1880'S WHITE MILK GLASS OPALINE UMBRELLA FIGURAL HANGING MATCHHOLDER. 1880's'Umbrella' white opaline milk glass figural hanging matchholder. Please refer to Thuro book 1 page 36 for more information on these early lamp appurtenances. This matchholder has the original embossed hooked'umbrella handle' to hang from an early lamp or wall-mount sconce. The white milk glass embossed umbrella has ribbed accents to act as a match striker. Fiery opalescent opaline milk glass, embossed in the glass patterned, traces of the original polychrome and gold highlights intact. Charming Victorian matchholder, often a difficult form to find. Approximately 6 1/2" long, and approximately 4 1/4" wide. Undamaged with no chips cracks or breaks. Lovely period Victorian hanging matchholder for the early lamp enthusiast. The democracy will cease to exist when you take away from those who are willing to work and give to those who would not. The item "1880's White Milk Glass Opaline Umbrella Figural Hanging Matchholder" is in sale since Wednesday, October 18, 2017. This item is in the category "Collectibles\Lamps, Lighting\Other Collectible Lighting". The seller is "capstan96" and is located in Ravenna, Ohio. This item can be shipped to United States.